Start saving $100’s on your homeowner’s insurance premiums by getting a wind mitigation report done on your house. Here is a little background on how it works and how you can take advantage of these savings. What is a Wind Loss Mitigation Report and Why Should You Get One? It’s a report that takes into consideration how your home’s construction minimizes the potential loss that might be caused by high winds or hurricanes. 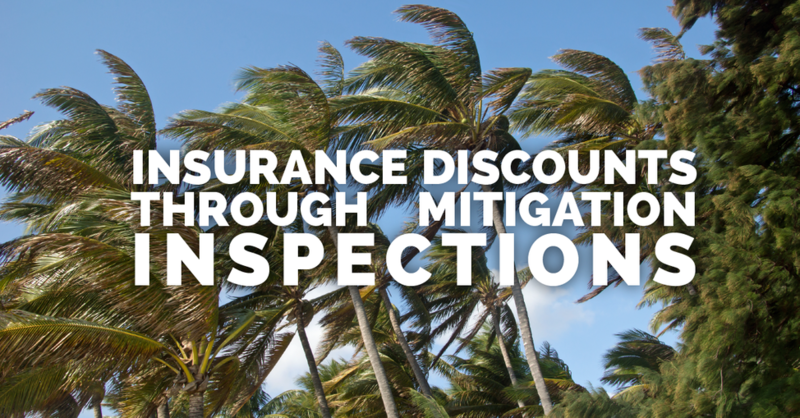 After the 2004 Hurricane season many Florida-based insurance companies were forced to increase premiums due the substantial losses they occurred. The Florida Legislature saw the rising premiums as a problem for Floridians so they agreed that if homeowners made steps to make their homes more secure from wind loss, they should be rewarded by a reduction in insurance premium. In order to get credits you must have a Wind Mitigation report completed by a licensed wind mitigation inspector. Many people believe that their Homeowners carrier is responsible for paying for the report, but that is “not” the case. You as the homeowner will pay for the report, but it typically pays for itself within the first year, with prices ranging from $70 – $125. These prices are typically reduced if you purchase the report in conjunction with another report such as a home inspection or 4-point inspection. Contact your insurance agent or carrier to discuss these savings to see if your home qualifies or if you are already receiving these credits. After the report is completed, contact your insurance agent or carrier and they will start the process of applying for the premium credits you deserve.